Repair Café at Chinese Mennonite Church held in November was covered by Chinese newspaper Sing Tao Daily in three articles, focusing on the event, the church’s volunteers and one of our co-founders (Nov. 12, 2017). 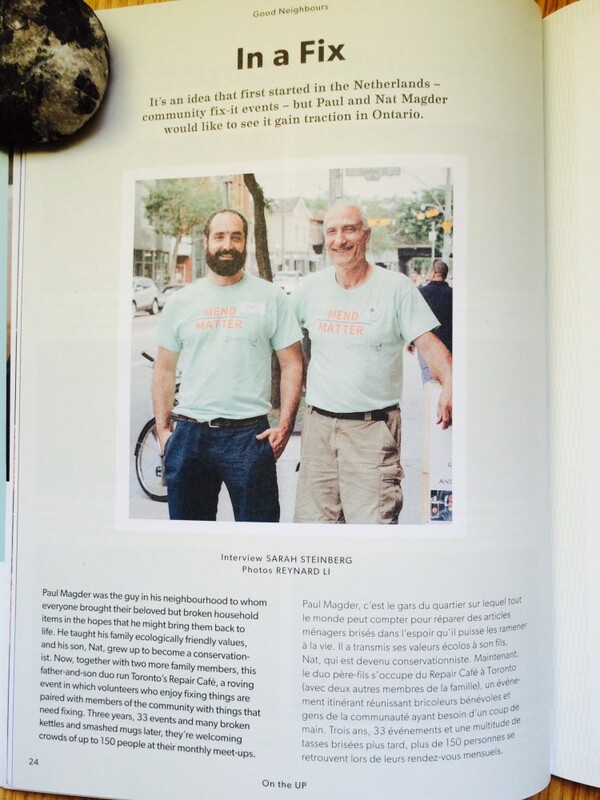 Repair Café co-founder being featured in the April 2017 issue of Canadian Living magazine in the article “10 amazing Canadians making the world a cleaner, greener place” by Shanda Deziel (Mar 21, 2017). 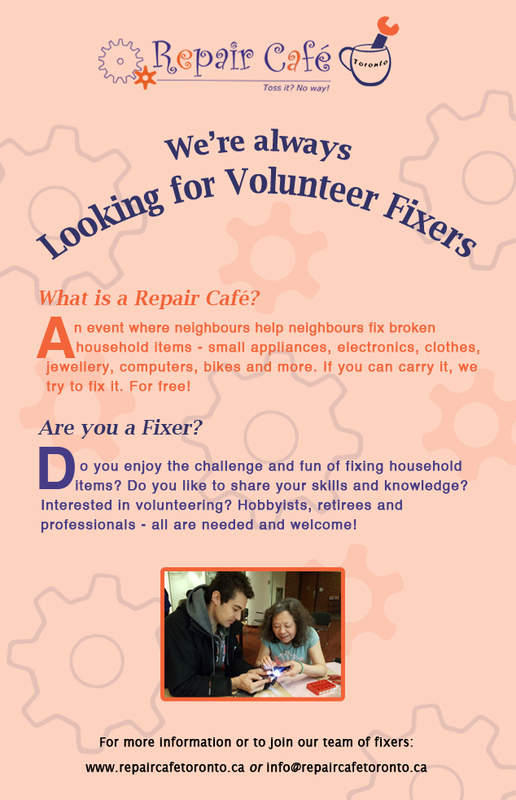 Our book repair fixer, Andy, was featured on Volunteer Toronto’s facebook page and website (February 27, 2017). An article “Repair Café Toronto aims to help ‘breathe life back’ into treasured processions” in Yahoo Finance Canada by Michael Shulman (February 23, 2017). An interview with the CBC radio “The Current” on the episode entitled Sweden gives tax breaks to repair – not replace – broken objects (October 12, 2016). An article “In a Fix” by Sarah Steinberg in On The UP magazine (Issue Six “Makers”, Fall 2016, page 24-25). 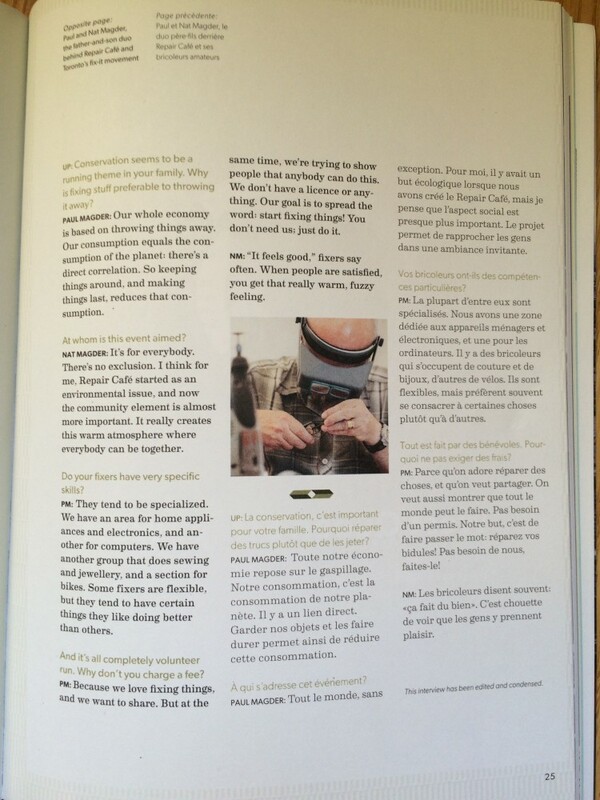 It is a bilingual publication of the Union Pearson Express and the magazine copies are available on the train for passengers to pick up and take home. An Interview at CBC’s Metro Morning in April 2015. The Repair Café was covered live in the episode “Zero Waste” of the CBC Radio show “What a Waste“. Look for the segment from 6:20 to 8:00.
projeté au Téléjournal Ontario le 12 avril. Faire avancer à 11:07.